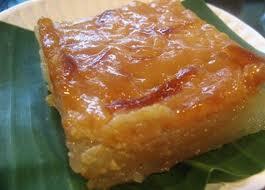 Cassava cake is one of the most popular and most delicious homemadedelicacies here in the Philippines. Making this cake, won’t take much of your time, because this is so easy to do. All you have to do is to make sure you got all the needed ingredients, which are: the most essential, grated cassava, sweetened condensed milk, evaporated milk, coconut milk, coconut cream, eggs and grated coconut. Making this cassava cake, involves two sections: making the cake and preparing the toppings. In making the cake, you just have to follow the given instruction below. Take note of the required oven temperature. Lastly, on preparing the toppings for the cake, you must make sure that the cake, is already done before you put the topping. To know, if the cake is already done, the top should be golden brown. So there you have it! This cassava cake also comes with different health benefits. Do you know that cassava is the third-largest source of food carbohydrates in the tropics? Well, yes. And with just eating a slice or two of this cake, you will eventually feel full enough. So, really hope you’ll bake this! Have a nice try! In large mixing bowl combine cake ingredients. Mix well. Pour equally into two large greased rectangular pans. Bake until top is no longer liquid (approximately 40 minutes to 1 hour). Mix topping ingredients well and spread evenly on the two cakes. Bake an additional 20 to 30 minutes. Cool cakes completely. Slice each cake into 24 equal squares.